With an updated look, sleek new packaging, and the debut of four bold, new flavors, The Coca-Cola Company is re-energizing and modernizing Diet Coke for a new generation of drinkers – and offering its millions of current fans a new look and more flavors. 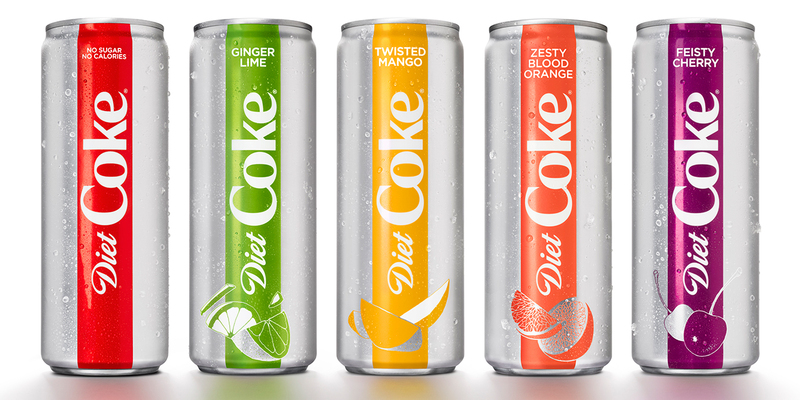 Ginger Lime, Feisty Cherry, Zesty Blood Orange and Twisted Mango bring more variety to the trademark by complementing the unique, crisp taste of Diet Coke with unexpected-yet-delicious tastes. Diet Coke and the new flavors will be packaged in sleek 12-oz. cans and sold as on-the-go singles and in eight-packs. Diet Coke also will continue to be offered in all existing package sizes, such as standard 12-oz. cans, mini cans, glass bottles and more. All new packaging and flavors hit store shelves on January 22, 2018.